Two decades after Michael Chiang’s “Army Daze”, it’s time to go OWN TIME OWN TARGET! Rediscover National Service in all its strangeness and familiarity with this laugh-out-loud double-bill featuring Laremy Lee’s FULL TANK! 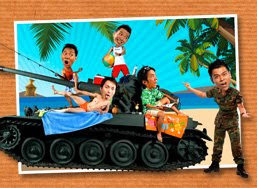 and Julian Wong’s musical BOTAK BOYS!Let these two hilarious, heartfelt and cheekily satirical comedies about NS remind you why we hate it, love it, fear it and ultimately, can’t live without it!FULL TANK by Laremy Lee – In the midst of an island-wide terrorist manhunt that’s whipped the authorities and the media into a frenzy, Sergeant Leroy and his motley crew hijack a tank and go AWOL, embarking on a joyride through Singapore’s streets! Are they criminals or heroes? Or are they just plain crazy? Join them on a hilariously bizarre and uniquely Singaporean road-trip, where they encounter madcap ministers, hard - nosed journalists, a hot Mamasan and her China hostesses! Set in a noble household in the Qing dynasty, five daughters gather on the eve of their father’s 60th birthday to prepare a delicately complex feast of crabs for their patriarch, as well as to set up an all-women poetry club. As each protagonist conjures up her own recipe, she also lays bare her intelligence, talent and desire on the culinary table. We become audience to their multi-faceted universe of morality, conspiracy and philosophy. Acclaimed for his design and literary flair, author and director Goh Boon Teck’s latest work is based on poems in Cao Xue Qin’s masterpiece, Dream of the Red Chamber. The Crab Flower Club is a calligraphic foray into the sensitive and simmering world of the female protagonists, accompanied by a live painting performance by Hong Sek Chern who unfolds the play’s setting as it progresses. With Franz Liszt’s symphonic poem – Les Preludes, sound design by Darren Ng, and a stellar cast, this sumptuous production is set to be an aural and visual gem that will shed light on the feminine psyche.